Okarito Kayaks is run by Gemma and Baz (us! ), with Rhianna, Jules, Callum and Jess helping out over the summer. We had been visiting Okarito since 2007, before taking on the kayaking operation in 2014 from our friends Rich, Ed and Monty. 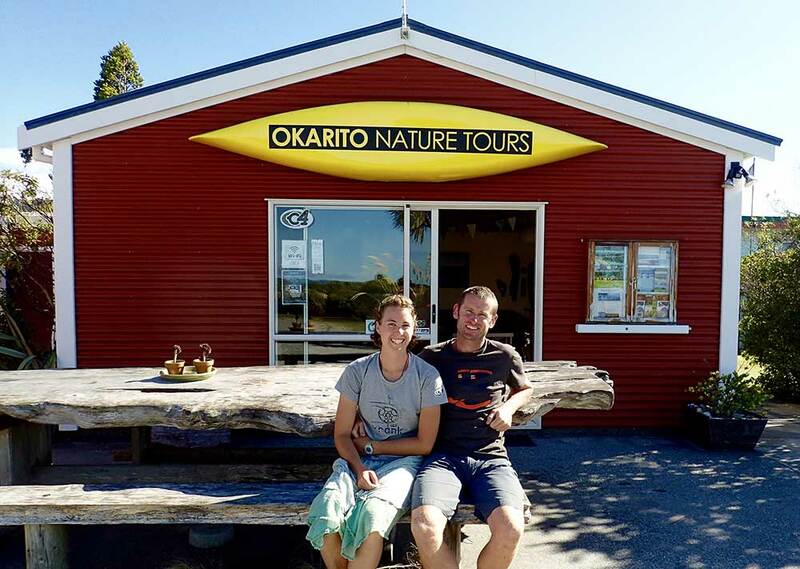 We renamed the business, from Okarito Nature Tours, to Okarito Kayaks, in 2016. Pretty much everything else about the place we wanted to keep as it is – it’s why we came here in the first place. Richard Saunders and Edwina Clarke operated the kayak side of Okarito Nature Tours from 1999, from the current site close to the lagoon, using the old garage from the house next door as the kayak shop. The local builder’s name is still pencilled onto the rafters in the shop. A larger shed for storage, and crucially, a coffee machine! were added over the years, and a whole lot of love as well to give the kayak sheds their homely feel and unique atmosphere. Both Gemma and Baz had been visitors to Okarito and kayak-borrowers for years; Edwina, Richard and Monty had talked about temporarily moving for Monty’s high-schooling, and so a three-odd year conversation was born that resulted in Baz and Gemma basically taking over Rich and Ed’s roles in the Okarito community. The challenge might well be for Ed and Rich to shift us back out when they move back from Bannockburn in a few years time. Okarito is now home for Gemma and Baz. You’ll likely find us behind the coffee machine, hosing out kayaks with our small team, or if we’re lucky, out happily guiding kayak trips on the Okarito Lagoon – drop in and say hi if you’re coming through.